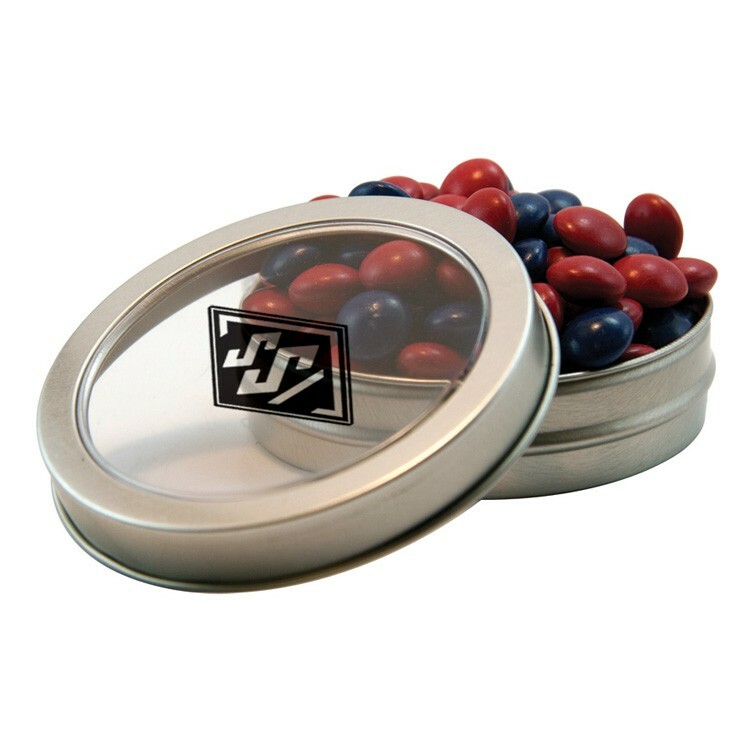 This slim see-through tin is filled with Corporate Color Chocolates and comes with a 1-color direct imprint. Tin color is silver. Can be filled with a variety of candies and nuts. Can be filled with Signature Peppermints, Gum, Red Hots, Jelly Beans, Peanuts, Sugar Free Peppermints, Candy Stars, Candy Hearts, Sugar Free Gum, Colored Candy, Chocolate Littles, Mini Tarts, Corporate Color Chocolates, Corporate Color Jelly Beans. The tin is made in China and the candy is made and filled in the USA. 1" H x 3.125" dia.